Through a residency with Washington Peace Center, I launched a campaign to celebrate local organizing in support of their annual Activist Awards. Planning it this year came at a time where people were feeling a range of emotions. whether it was hopeless, nervous, weighed down, or fired up to fight back. The purpose of this project was to serve as motivation, inspiration and optimism, especially for people who felt the weight and chaos. 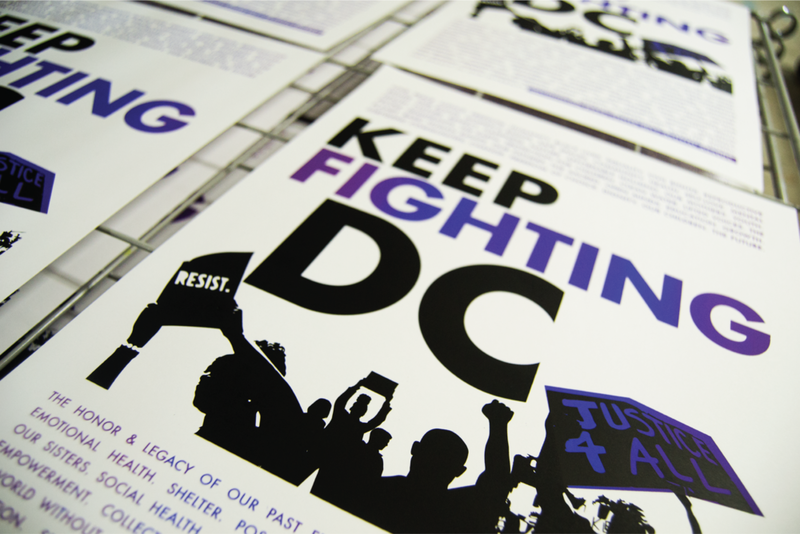 After connecting with local activists, pulling inspiration as a DC native, I developed the #KeepFightingDC brand campaign. There's many fights to be fought. From collective action, love, sacred ground, black lives, to affordable housing, I combined a list of over 100 things that DC fights for. I screenprinted and painted a 21 foot banner for the event, designed and screenprinted 75 posters that were for sale. The hashtag #KeepFightingDC was trending in DC the night of the awards. Energizing the spirit of DC, the communities that hold it together to make it what it is, and the people who do this amazing work to create positive social change was the motivation behind this project.